Earlier this month we sent several members of our team to Philadelphia to attend Educause: an annual conference that brings together many of the brightest IT minds in higher ed. Being true believers in the idea that one can never stop learning, we were excited to meet with so many great people. While we learned about the current and upcoming trends in the field of higher ed tech, we also used this opportunity to uncover the wants and needs of today's higher ed admins. In case you missed it, here are our top 5 takeaways from Educause 2017: 1. IT leaders care just as much about student outcomes and success as other departments. The role of the IT department in higher ed is transforming from managing systems and fulfilling technological requests to enabling business transformation via technology across the entire institution. 2. Chief Information Officers (CIOs) are crucial to understanding the structural impact of technology. 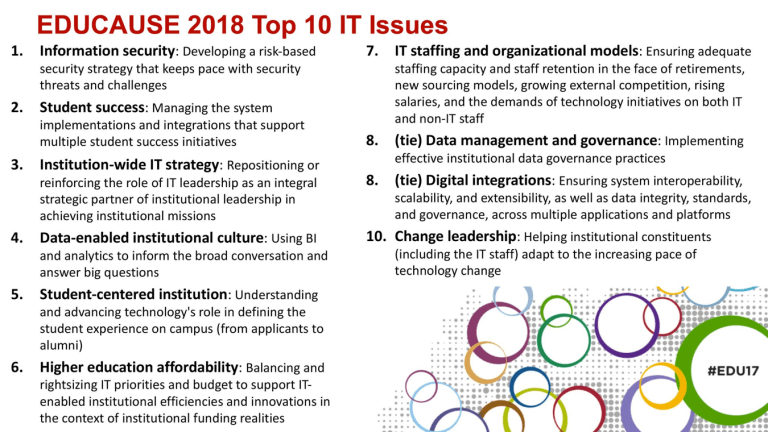 The CIO's new strategic role requires them to not only understand technology, but to help the entire institution understand technology's impact across the broader educational enterprise. 3. Personalized experiences are the future of higher ed. Individuality is important to Gen Z'ers. They expect a personalized experience in their education, especially for the tuition they are paying. Data collection and analysis will play an important role in helping institutions meet this demand. 4. There has been a shift towards storing data in the Cloud. An increasing number of higher ed institutions are moving towards storing their data in the Cloud rather than on-site, increasing accessibility and reliability. This shift allows the IT department to spend less time updating and maintaining hardware, and allows them more time to focus on strategic projects. 5. Privacy and data security is always a top priority. With the ever increasing number of data breaches across North America, security remains the main focus of higher ed institutions. Having an air-tight security strategy is critical for keeping data and information private and protected. Bonus insight on mobile campus platforms: Last year we saw an increase in desire for higher ed institutions to develop custom mobile campus apps. This year, we've noticed a shift from institutions simply wanting a platform that displays mobile-friendly pages, to one that actively increases student engagement.